Official stamps of Belgium related to Paleontology: dinosaurs, fossils, paleontologist . 28.05.1966 "National Science Heritage"  20.10.2001 "The 20th Century"  07.09.2015 "Dinosaurs"
27.08.2018 "Face to face with prehistoric animals"
. Pierre Teilhard de Chardin, paleontologist who took part in the discovery of Peking Man, depicted on the third stamp in the second row from top. [A1] On occasion of "the 150th Anniversary of the Institute of Science", post of Belgium issued a booklet with sic insect stamps. The building of the musuem and stylized Iguanodon depicted on the reverse side. Thirty relatively complete iguanodon skeletons were discovered 322m underground in a coal mine in Bernissart, Belgium at the end of the 19th century. Since the bones were still in their original position, it was possible to present the skeletons in ‘lifelike’ poses. 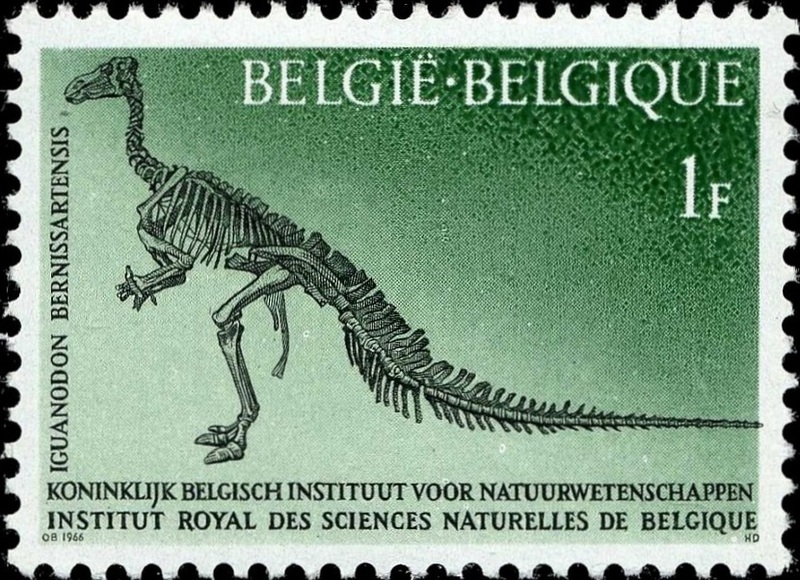 One of the Iguanodons was depicted on stamp of Belgium 1966. [A2] The Africa Museum is recognized worldwide for its rich, varied and scientifically valuable collections. The majority of its visitors are unaware of the size of this heritage as the permanent exhibition only has about 1% on display. The museum is known for its ethnographic objects, but its natural science collections, archives and photos are equally remarkable. The vast majority of the objects come from the DR Congo and were collected during the colonial period. However, the museum's collections contain specimens from around the world, dating back 650 million years (for some of the fossils) to the present day. The fossil collection has more than 18,000 specimens from Central Africa, collected through fieldwork or acquired through donations. The collection is very diverse in terms of types of specimen (from the remains of large reptiles to microscopic skeletons of unicellular organisms) and in terms of age (approximately 650 million years to a few thousand years old). Examples of large specimen series include: stromatolites from the Neoproterozoic (Lower Congo, Katanga, Kasaï) ; plant fossils from the Carboniferous-Permian (Katanga) ; fish fossils from the Jurassic-Cretaceous of the Congo Basin ; a diverse fauna from the Cretaceous-Cenozoic of the Atlantic coastal region (Lower Congo, Angola, Congo-Brazzaville, Gabon). [COV1] Iguanodon is a symbol of Royal Belgian Institute of Natural Sciences , fossil of this dinosaurs depicted on covers of the institute in 1970th. as well as on stamp in 1966 and a booklet cover in 1996.